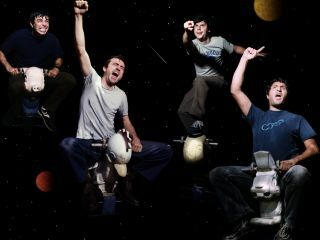 Former Shins drummer Jesse Sandoval revealed the real reason for his departure from the band earlier in 2009. At the time, frontman James Mercer told Pitchfork that it was "an aesthetic decision". Sandoval now tells The Portland Mercury: "I was fired". He didn't punch bandmates or anything. Sandoval was fired because he wasn't able to play the drum parts for the band's new songs. He admits: "I have a slower learning curve than polished musicians. There were some drumbeats that [Mercer] tried to do, that he asked me to do, and I just couldn't do them. "In the studio, I didn't have the luxury to take lots of time to execute drum parts, and you can't really piecemeal drums. So my weaknesses showed ... working with [producer] Danger Mouse only exacerbated that fact". Sandoval insists he doesn't hold with Mercer's polite public statement, saying: "It might be hard for him to say it, but I got fired. There's no other way of looking at it. He turned the page, he wanted to do something else, and he's OK with that. And everybody, me included, can judge him".